Use apt-get or yum to install DHCP server. The DHCP server IPv4 configuration file is located at /etc/dhcp/dhcpd.conf. By default, this file is empty. An example configuration file is at /usr/share/doc/dhcp-<verison>/dhcpd.conf.sample. The configuration file should at least have the following. Range is the range of IP addresses that can be leased by clients. In this example, IP addresses 192.168.0.1 through 192.168.0.99 cannot be leased, so that these IP addresses can be used as static IP addresses for servers and infrastructure devices. The IPv6 configuration file is located at /etc/dhcp/dhcpd6.conf. By default, this file is empty. An example configuration file is at /usr/share/doc/dhcp-<verison>/dhcpd6.conf.example. The configuration file should at least have the following. Allow DHCP in iptables or firewalld. Enable the DHCP service, start the DHCP service, and ensure the DHCP service is active and running. 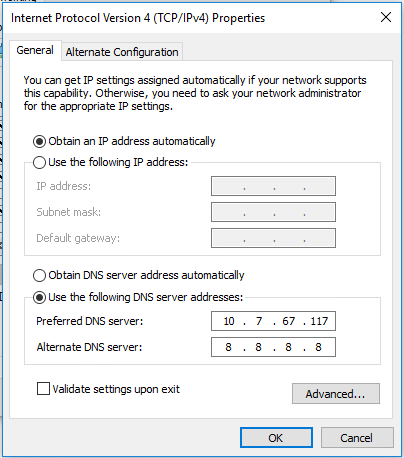 Ensure the Windows client does not have a static IP address and also is pointing to DNS servers that are able to resolve the IP address of the DHCP server. In this example, 10.7.67.117 is the IP address of a local DNS server that contains the lookup information for the DHCP server. Use the ipconfig /release and then ipconfig /renew command, and then verify IP address of the Linux DHCP server is listed. Also, the Windows client should now have leased an IP address, subnet mask, and default gateway from the Linux DHCPD server. The dhcpd.leases file on the DHCPD server should contain a record with the IP address that was leased to the Windows client. On a Linux PC that is configured to use DHCP, ensure the avahi-daemon is not active and disabled. Use the dhclient command to lease an IP address from the DHCP server (replace wlan0 with the actual name of the interface). Use the nmcli dev list iface command to verify the client received an IP address from the DHCP server. Back on the Linux DHCP server, the /var/lib/dhcpd/dhcpd.leases file will contain a block for each client in the network that has leased an IP address from the DHCP server. If there is some problem, check the log file. The following command can be used to watch the log file in real time. A successful lease should produce 4 events, DHCPDISCOVER, DHCPREQUEST, DHCPOFFER, DHCPACK.